While the burgeoning EHR movement gains the lion’s share of attention and hype, for most facilities the real world is a bit less glamorous. Many live with hybrid records and anticipate living with a blend of paper and electronic records for some time. In October 2009, Meta Health Technology partnered with the AHIMA to conduct a member survey on the effects of the hybrid record. The goal was to learn more about how facilities are managing the challenges related to the hybrid environment and to share useful insights with other HIM professionals. This article summarizes the survey’s highlights and presents assessments based on actual cases that may help other facilities manage their hybrid records more efficiently. Nearly 80% of the facilities that participated in the survey are maintaining hybrid records. More than one half of the respondents said that 50% to 75% of their records were on paper. While some facilities (14%) expected to achieve a total EMR within the next 12 months, 72% of them won’t be fully electronic for at least 18 months. The fact that so many facilities have—and will continue to have—some records on paper compels an innovative approach to handling hard-copy records. This mirrors the experience of Meta Health clients who have adopted a variety of technologies to streamline their processes in a hybrid environment. For example, many have implemented an e-signature system with scanning capability to enable their physicians to easily sign both electronic and hard-copy documents. As additional documents are subsequently transitioned from paper to an electronic format, system interface changes can be made to accommodate the electronic physician signature. In the survey, 81% of the respondents reported that their facilities were capturing signatures electronically. While they reported that a significant percentage of their physicians were then using their digital signature system, for some physician resistance had been an obstacle in achieving widespread adoption and usage. Gaining physician compliance is often a challenge for HIM professionals, particularly when it comes to record completion requirements. Providers often achieve the greatest success in implementing an e-signature and completion program when they focus their initial effort on a pilot group of physicians. This not only allows the facility to resolve any complexities that arise before go-live but also provides them an opportunity to identify a physician champion who can assist in advocating for the new product or application. Additionally, communicating the quantitative results of implementation successes to key physician stakeholders through an in-house newsletter or other vehicle is an effective strategy for encouraging further physician adoption. Automation of the deficiency management process can be an effective way for facilities to streamline HIM operations, particularly when they utilize a system that can automatically identify documents needing analysis. In the survey, 54% of the respondents said their facilities had automated the process, and 65% of that group said their system could automatically identify documents needing analysis. Deficiency management is often the bane of an HIM department’s existence, as the success of that process drives the department’s ability to provide complete information for continuity of patient care, reimbursement, quality reporting, research, and a multitude of other healthcare activities. For that reason, it is essential for facilities to establish an efficient and effective record completion cycle, from analysis process to physician signature. Meta Health clients that automated the chart completion process not only reduced their completion costs by as much as 60%, they also saw measurable improvements in physician satisfaction. The survey also examined the adoption of HIM workflow software as a means to streamline operations. Relatively few survey respondents (24%) reported that their facility was using workflow software for HIM document management. For those hospitals, it was used most frequently in routing documents for internal coding and to physicians for e-signatures. Respondents believed that workflow software had enhanced HIM functions across the board, predominantly in coding (internal and remote), abstracting, and deficiency management. Record completion was considered the highest priority department function for workflow automation going forward (ranked 4.3 of 5 in priority), followed by deficiency management (4.1 of 5) and internal coding (4.07 of 5). Many HIM process outcomes are the product of a hand-off between individuals or units or from one function to another (ie, from analysis to coding to diagnosis-related group assignment). As a result, workflow automation is a natural complement for HIM operations because it provides an integrated transfer that is built right into the facility’s system or application. Meta Health clients have recognized the importance of integrating workflow at various levels—some are as simple as interfaces between products while others are more advanced, involving workflow engines. While HIM professionals continue to work in a hybrid environment, it is particularly important to take advantage of workflow capabilities in new or existing systems to help operational efficiency continue to improve. — Barbara Hinkle-Azzara, RHIA, joined Meta Health Technology as chief product strategist in 2007. She previously served as the HIM director at three acute care teaching facilities in New York City. 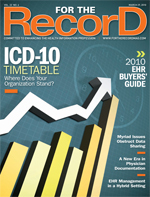 The survey results presented in this article were compiled by the American Health Information Management Association in the “Hybrid Record Survey 2009 Convention Summary Report” © 2009. Publication prepared by Meta Health Technology Inc.